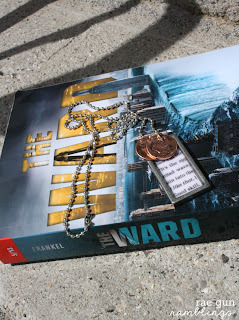 I’ve read A LOT of great books over the last month or so but one that just blew me away was The Ward by Jordana Frankel. I was lucky enough to receive an advance copy of it (it should be in bookstores everywhere tomorrow) and I just fell in love. But more about that later. As with all books that I love I wanted to immortalize it in craft. There were a few things that stood out to my crafty side. First the phrase “Good Skill” as a substitute for “Good Luck” I really liked that concept. And then the main character Ren wears good luck pennies on a necklace. So I decided to make myself a “Be Like Ren” necklace. And I absolutely love it. I just like the look of it! But even if you’re not a book geek I think this could be a super darling Mother’s Day project. You could find pennies in the years that the mom’s kiddos were born and then instead of the “Good Skill” quote you could use a dictionary page on the word “mom” or “mother”. I think that would be really sweet. 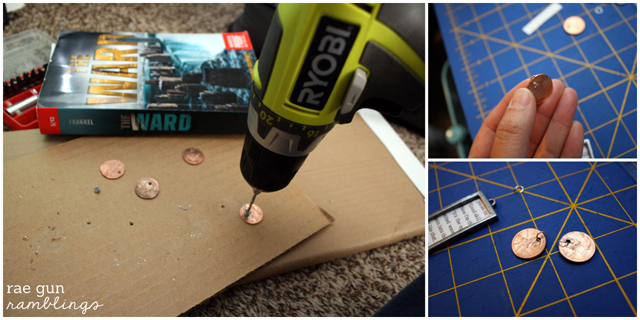 First you want to put holes in your pennies I just drilled them in with a regular drill. Easy. Then add jump rings to the pennies. Make sure to separate the rings by pushing the sides parallel as opposed to just opening the circle. To make the pendant you want to measure the size of your works image space. 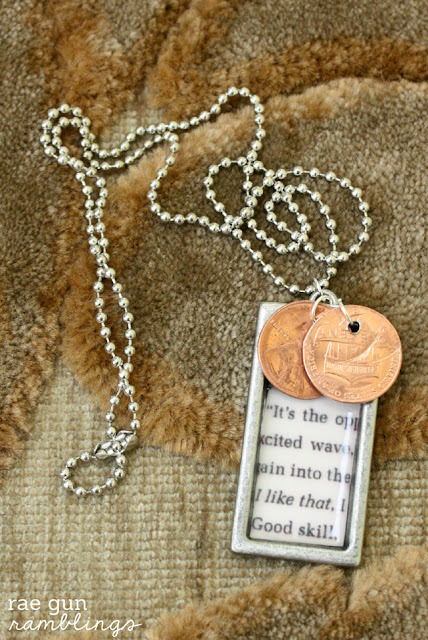 I used 2×4 pendants and the space was 1.75×0.75 inches so that’s the size I made my text. Scan your image, size it, and print it. Trim along the edges. 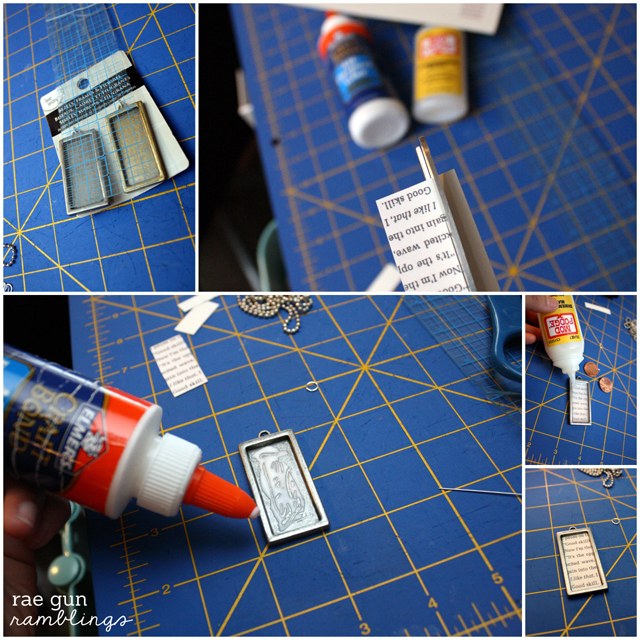 Then glue the paper into the pendant. Let dry. Then add a thin coat of dimensional magic. 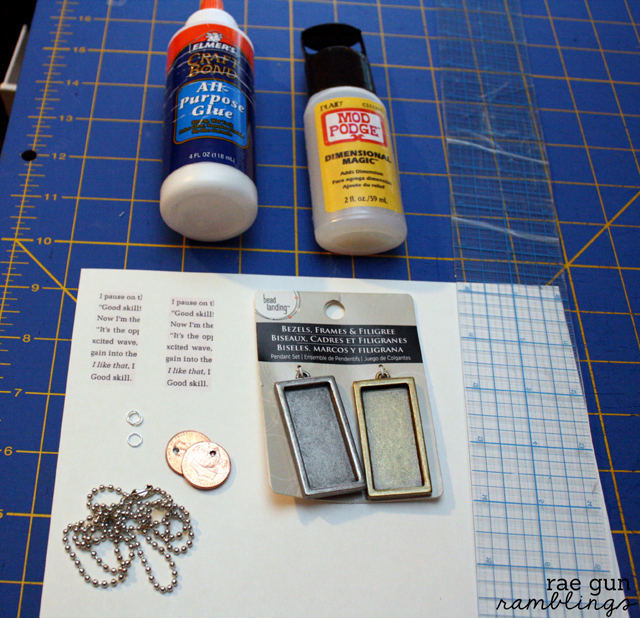 This will give it a glassy resin like finish (I’ve said it before but this is my absolute favorite craft product). Let dry for a few hours (I just do it overnight). Attach the pennies to the pendant with jump rings and string on a chain and you are good to go! And if you are curious about the book that inspired this project, The Ward, I like to describe it as a dystopian Speed Racer in water meets American folklore. The synopsis which you can read on amazon or goodreads made it sound interesting but it’s so much more than it describes. Something really clicked with me for this one. Like in the way that Insignia, Ender’s Game and Ready Player One clicked for me. Really I loved it. There are so many layers to the story which made it more interesting. And it is definitely it’s own unique thing. The Ward is a fast paced fresh story, with great characters, conflict, action and unexpected twists. It’s a bit hard to describe without giving too much stuff away but suffice it to say it is one of the only books I gave 5 stars to so far this year. You can read my full review here. I love this! I can’t wait to read the book! THis one is SO easy. really it is I promise. this is really cool – I may have to borrow a drill from my dad to do this ;-) Thanks for sharing this!! totally worth borrowing a drill for! This necklace is awesome. And knowing that it links back to a great book is even better! Love it!! Marissa, I love this necklace! I will definitely be reading this book. 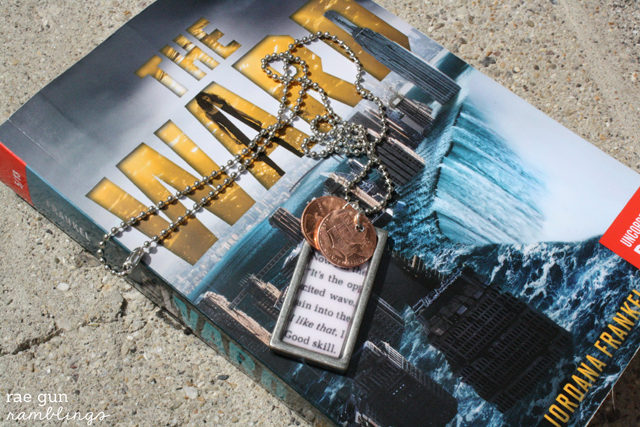 Like always, the necklace looks awesome! I know you love Young Adult novels like me, so I just wanted to make sure you knew about my giveaway for a new Young Adult novel. I’d love for you to check it out. 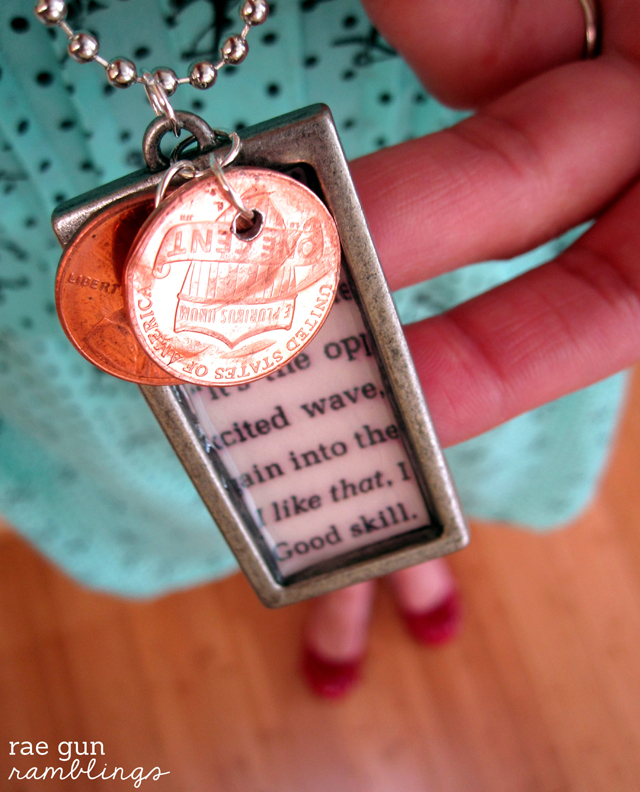 May your penny necklace stow upon you many days filled with luck! I really love that necklace, like that it’s a bit different, specialized. I’ve always liked those necklaces that have words stamped in a metal disk but like yours even better as I can make that without having to buy special equipment. I love the necklace. So cute! I’m definitely checking out the book. I love to read and can never have enough in my Goodreads “to read” list. Thanks for sharing!! I love how this is connected back to a book! Very creative! I am new from southern charm! 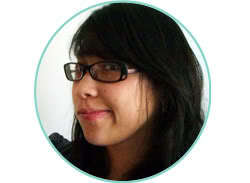 I would love for you to check out my blog and follow me back, Nicole!